How to Cite This Chapter: Brimble KS, Januszewicz A, Prejbisz A. Renovascular Hypertension . McMaster Textbook of Internal Medicine. Kraków: Medycyna Praktyczna. https://empendium.com/mcmtextbook/chapter/B31.II.2.20.2 Accessed April 24, 2019. Renovascular hypertension is a secondary cause of hypertension due to renal ischemia and subsequent hypersecretion of renin. Ischemic nephropathy is a reduction in the glomerular filtration rate (GFR) and impairment of other kidney functions due to hemodynamically significant renal artery stenosis. Causes of renal artery stenosis: The most common causes are atherosclerosis (usual risk factors apply) and fibromuscular dysplasia. Other causes: Table 1. A hemodynamically significant stenosis (ie, >60%-70% of the artery diameter) of the renal artery or arteries results in hypoperfusion of the kidney as well as an increase in the activity of the renin-angiotensin-aldosterone (RAA) system and its subsequent effects. 1) A sudden onset of hypertension, development of hypertension before the age of 30 years. 2) Development of severe hypertension after the age of 50 years. 3) Treatment-resistant or malignant hypertension. 4) Deterioration of renal function (eg, >30%) after the administration of an angiotensin-converting enzyme inhibitor (ACEI) or an angiotensin receptor blocker (ARB). 5) Unexplained renal atrophy or a difference >1.5 cm in the kidney size. 6) Unexplained progressive deterioration in kidney function. 7) Unexplained flash pulmonary edema. 8) Fibromuscular dysplasia of other vascular beds. 9) An epigastric or abdominal bruit. 2. Natural history: Over time significant renal artery stenosis—particularly when bilateral—may lead to the development of ischemic nephropathy and progressive chronic kidney disease (CKD). Fibromuscular dysplasia is also progressive and is associated with the development of new stenoses and arterial lesions (aneurysms and dissections). Diagnostic and management algorithm: Figure 1. Most patients with atherosclerotic renal artery stenosis should be managed medically.Evidence 1Strong recommendation (benefits clearly outweigh downsides; right action for all or almost all patients). Moderate Quality of Evidence (moderate confidence that we know true effects of the intervention). Quality of Evidence lowered due to imprecision. Jenks S, Yeoh SE, Conway BR. Balloon angioplasty, with and without stenting, versus medical therapy for hypertensive patients with renal artery stenosis. Cochrane Database Syst Rev. 2014;(12):CD002944. doi: 10.1002/14651858.CD002944.pub2. Review. PubMed PMID: 25478936. Cooper CJ, Murphy TP, Cutlip DE, et al; CORAL Investigators. Stenting and medical therapy for atherosclerotic renal-artery stenosis. N Engl J Med. 2014 Jan 2;370(1):13-22. doi: 10.1056/NEJMoa1310753. PubMed PMID: 24245566; PubMed Central PMCID: PMC4815927.Investigation for renal artery stenosis should therefore be reserved for those with compelling indications to proceed with interventional approaches if renal artery stenosis is identified (see below). 1. Laboratory tests may reveal hypokalemia and albuminuria, although the latter is usually mild. An increase in serum creatinine levels and decrease in the GFR are frequently observed. Plasma renin activity (PRA) and aldosterone levels are often increased. 1) Intra-arterial digital subtraction angiography (DSA) is the most accurate method of imaging renal vasculature and is considered the gold standard. It is indicated in patients in whom the final diagnosis cannot be established using less invasive studies and there is an intent to proceed with an intervention if renal artery stenosis is confirmed. 2) Duplex ultrasonography, computed tomography angiography (CTA), and magnetic resonance angiography (MRA) are reasonable initial noninvasive imaging modalities. Duplex ultrasonography may provide better functional versus anatomical information but is often limited due to the length of the procedure and lack of expertise. Limitations have been identified in the use of all noninvasive modalities, although many of the studies predate more recent advances in imaging quality. Ultimately, the choice of the initial test should be decided based on availability and local expertise, recognizing that most patients do not require imaging and can be managed medically. As a general rule, a positive test is more helpful than a negative one. CTA and MRA may miss lesions of fibromuscular dysplasia that are subsequently detected on DSA. 3) The advantages of captopril renal scintigraphy are its noninvasive nature and the absence of nephrotoxic effects of radiopharmaceuticals (unlike in the case of radiographic contrast media). However, this test has fallen out of favor due to high false-positive and false-negative rates and limitations in those with preexisting CKD or bilateral renovascular disease. 3. Renal vein catheterization may be useful in determining indications for nephrectomy but is used infrequently. It allows for measuring PRA in the venous blood. Diagnosis is based on the results of the imaging studies. 1) Primary and secondary hyperaldosteronism (hypokalemia). 2) Renal parenchymal disease (renal failure). 1. Goals of treatment: Achievement of blood pressure targets (see Essential Hypertension). Treatment also includes modification of the factors predisposing to the development of atherosclerosis and treatment of comorbidities. 2) Revascularization: Percutaneous balloon angioplasty, percutaneous angioplasty with stenting, surgical correction of stenosis. 2) Beta-blockers: Their beneficial effect may be partially related to the inhibition of renin secretion. 3) Diuretics: Thiazide diuretics and/or a mineralocorticoid receptor antagonist are often effective. Monitoring of kidney function and serum potassium levels is indicated when initiating. 4) ACEIs and ARBs are effective but may affect the function of the kidney supplied by the stenotic artery. These agents are contraindicated in patients with bilateral renal artery stenosis or renal artery stenosis of a solitary functioning kidney. Monitoring of kidney function is mandatory. 5) Antiplatelet therapy: Consider antiplatelet agents in patients with atherosclerotic renal artery stenosis treated with medical therapy provided there are no contraindications.Evidence 2Strong recommendation (benefits clearly outweigh downsides; right action for all or almost all patients). Low Quality of Evidence (low confidence that we know true effects of the intervention). Quality of Evidence lowered due to the observational nature of data and extrapolation of data from other cardiovascular territories. Ritchie J, Green D, Alderson HV, et al. Associations of antiplatelet therapy and beta blockade with patient outcomes in atherosclerotic renovascular disease. J Am Soc Hypertens. 2016 Feb;10(2):149-158.e3. doi: 10.1016/j.jash.2015.12.002. PubMed PMID: 26778771. 6) Lipid-lowering therapy (statins): Patients with atherosclerotic renal artery stenosis warrant treatment with statins provided there are no contraindications.Evidence 3Strong recommendation (benefits clearly outweigh downsides; right action for all or almost all patients). Moderate Quality of Evidence (moderate confidence that we know true effects of the intervention). Quality of Evidence lowered due to the lack of experimental evidence in this population but increased to moderate due to the use of lipid-lowering therapies in trials of optimal medical therapy and indirect evidence of benefit in other vascular territories. 1) Coexisting severe, refractory, or malignant hypertension despite maximal medical therapy. 2) Recurrent episodic flash pulmonary edema of unexplained etiology. 3) The etiology of the renal artery stenosis is fibromuscular dysplasia. 1) Percutaneous renal angioplasty is the method of choice in most patients with renal artery stenosis caused by fibromuscular dysplasia. It is also effective in individuals with inflammatory stenosis (eg, Takayasu disease). The procedure may be performed only in patients in remission. Stenting is very rarely necessary and could impede the ability to proceed with surgical revascularization, when required. 2) Percutaneous renal angioplasty with stenting: In atherosclerotic renal artery stenosis, stenting is preferred over balloon angioplasty alone. In patients with stenosis caused by fibromuscular dysplasia, stenting is performed only in case of complications of angioplasty (arterial dissection). 3) Surgical renal revascularization is currently rarely performed and usually involves an aortorenal bypass graft. Occasionally surgical revascularization is required in lesions secondary to fibromuscular dysplasia, when angioplasty is not possible or ineffective. 1) Assess kidney function 24 hours after the procedure and then after 2 to 3 days. Carefully monitor blood pressure on the first day after the procedure because of the risk of hypotension. 2) Extrapolating from the interventional cardiology literature, the pattern of practice is to administer acetylsalicylic acid (ASA) 75-325 mg/d for lifetime; for the first 4 weeks after stent implantation, add clopidogrel 75 mg/d (in patients with implanted drug-eluting stents, consider extending clopidogrel therapy to 12 months). 3) To assess long-term effects of the procedure, continue to monitor blood pressure and renal function, initially more often and periodically thereafter. 2. Diagnosis: Indications for diagnostic workup of fibromuscular dysplasia: see Clinical Features, above. If first-degree relatives of a patient with fibromuscular dysplasia develop hypertension at a young age or have dissection of any artery, an aneurysm, or cerebral bleeding, they should be evaluated for fibromuscular dysplasia. 1) Duplex ultrasonography (a potentially useful screening test with the same caveats as raised previously [see General Principles, above]). 2) MRA or CTA (the latter is preferred) to confirm the diagnosis or as a first-line study (in patients in whom duplex ultrasonography is presumed to be suboptimal [eg, obese patients]; these diagnostic methods are also used in the case of a very strong suspicion of fibromuscular dysplasia and/or serious clinical implications of the diagnosis [patients who are very young; patients with malignant hypertension or complications of hypertension, including complications affecting other vascular beds; patients with elevated serum creatinine levels]). 3) Intra-arterial DSA in patients with a strong suspicion of fibromuscular dysplasia in whom after performing all the above studies diagnosis is still equivocal or in patients with fibromuscular dysplasia confirmed by CTA or MRA in whom revascularization is indicated. 4) Differential diagnosis: Consider other rare diagnoses, including renal artery spasm; arteritis; and genetic diseases, such as type 1 neurofibromatosis, tuberous sclerosis, pseudoxanthoma elasticum, Ehlers-Danlos syndrome, Alagille syndrome, Williams syndrome, and Turner syndrome. 1) A recent onset of hypertension (this is the treatment of choice to normalize blood pressure). 2) Treatment-resistant hypertension or intolerance of antihypertensive drugs. 3) Renal failure or deteriorating renal function, particularly after the administration of an ACEI or ARB. Preferred modalities of revascularization: see Revascularization, above. 1) Measure blood pressure monthly until target values are achieved. 2) Our pattern of practice is to measure serum creatinine (estimated glomerular filtration rate [eGFR]) levels and perform ultrasonography on a yearly basis to assess the kidney size. 1) Measure blood pressure and calculate the eGFR 1 month after the procedure. 2) Our pattern of practice is to perform renal imaging studies 6 months after the procedure, or earlier in case of elevated blood pressure or serum creatinine levels. Adapted from: Textor SC, Lerman L. Renovascular hypertension and ischemic nephropathy. Am J Hypertens. 2010 Nov;23(11):1159-69. doi: 10.1038/ajh.2010.174. Figure 1. 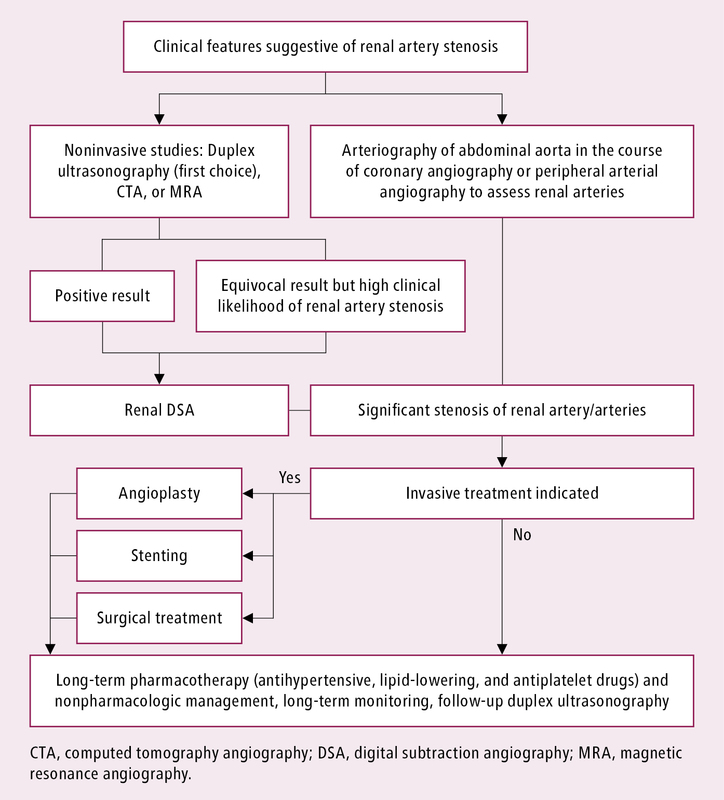 Management algorithm in patients with hypertension and renal artery stenosis.